You may remember a while back we reviewed the latest update of GFI LANguard 9, another powerful product developed by GFI is EventsManager. Managing, archiving and monitoring logs and SNMP traps for a whole network can be a bit of a logistical nightmare, that’s where products like this come in. Commonly they are known under the umbrella term Business Intelligence Systems or more specifically Log/Event Management. Installation is easy enough as per usual with GFI software, configuration will be a little more complex depending on the architecture of your network. If you have any problems however you can download the user manual here – esm8manual.pdf [PDF]. 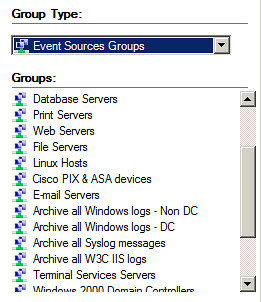 Do note you will require a local or remote instance of MS-SQL for events archiving. You can download and use MS-SQL 2005 Express Edition (which is free). You can find an overview of the software here and a full features list here. Once you get started you’ll need to setup the MS-SQL database before you can do anything else, so either put the details for your remote server or install the free express edition then set up the database. After that you can select if you wish to process local computer events, selected machines or setup custom config (snmp traps/syslog). 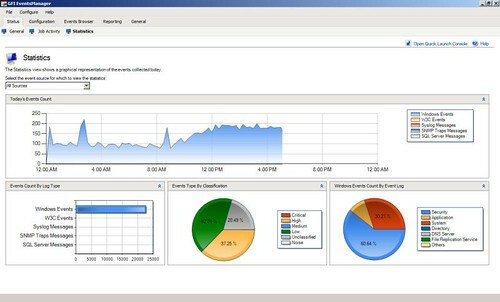 There are a lot of options in the configuration management and allows you to easily aggregate the logs/SNMP output from a whole network. It allows logging from a plethora of devices including Windows and Linux servers, Cisco devices, Juniper devices, laptops, desktops and databases. The main screen gives you a very simple overview that the services are running correctly and the global events count with a break-down by type. The graphing view allows you to visually see by source or globally by event classification and volume flow by hour. 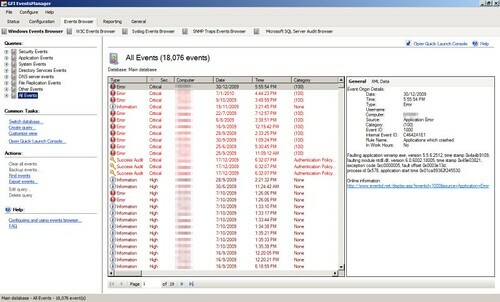 The Event Browser allows you to view individual events, drill down to the details captured and sort them by status allowing you to track down problems easily and diagnose which application is causing the problem. 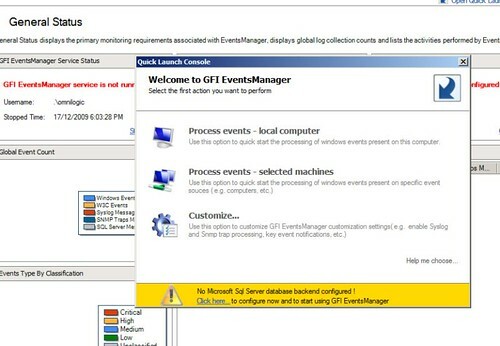 You can also add the free GFI EventsManager ReportPack, which enables you to generate graphical IT-level, technical and management reports based on the hardware and software events processed by GFI EventsManager. Pricing runs as low as $45.00 per node for Servers and $4.50 per node for Workstations if you buy in bulk.